Where you are positioned along the firing line can have an impact upon your final score. How? Well, it depends upon the physical layout of the range where you are shooting. Many ranges are bordered on one or both sides by trees, since many ranges have been built in wooded areas in an attempt to keep the noise and complaints down from neighboring communities. In a case like the one mentioned above, your best bet for a favorable position on the firing line is one in the middle, not at the ends of the firing line. The reason is because cross-winds blowing over the trees create an area of disturbed or turbulent air along the tree line. That area of turbulent air can cause your bullet to do all kinds of unexpected things. More than once I have been assigned a shooting position near the end of the firing line and had shots unexpectedly miss the target or shift radically from the center to the edge of the target. Although many people might attribute this to “shooter error” it seems strange that these things have oftentimes happened when I had a good string of scores going (i.e. a “10”, a “9”, a “10”, a “10”, and then a wide “6” or even a “Miss”). The direction in which the range is laid out can also present problems. Probably the best orientation for a range to be built is in a south (firing line) to north (target line) configuration. This orientation will place the sun at the shooter’s back and hopefully result in the sun shining directly on the targets for the longest possible period of time. However, if there are tall trees that wrap around the end of the target line, even with an ideal range orientation, they may cast shadows on the end targets in the early morning or late afternoon. If you’re positioned on either end of the firing line when these conditions occur, you’re going to be shooting at a disadvantage when compared to someone who is positioned in the middle of the line away from the shadowed areas with his or her targets in the sunlight. Unfortunately, the shooter usually has little say in where he or she is assigned to shoot. 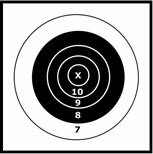 Generally, shooting positions are assigned by a lottery system with the shooter’s name pulled from a hat or in the order in which you registered. This is done in an attempt to treat everyone equally, without favoritism or prejudice. However, if you ever do have a chance to have a say in where you are assigned on the firing line, my advice would be to try to get a position in the middle of the line for the reasons I have listed above.